A cottage on a corner lot with beach and bay access in Westhampton Beach is on the market for $839,000. Many may have seen the 18-year-old, three-bedroom, 1 ½-bath ranch. 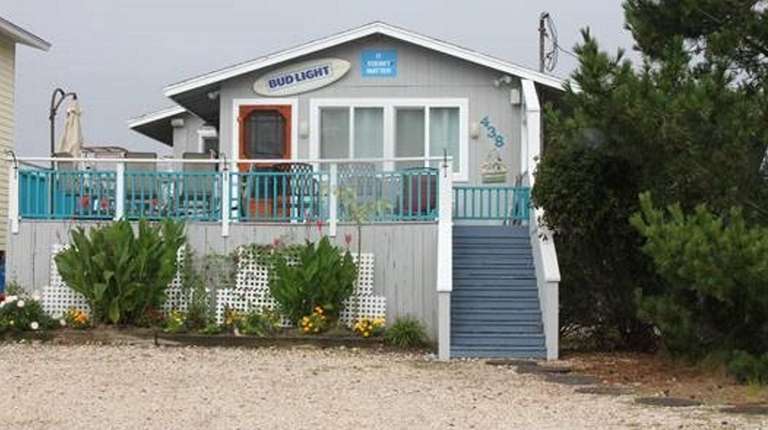 There’s a flip-flop sign and Bud Light surfboard mounted to the front of it, and at the home’s peak, a bright blue sign with white lettering that says: “It doesn’t matter.” They hang above an oversized wraparound deck with a gas barbecue and outdoor shower. The 4,356-square-foot corner lot has private beach access across the street, and Moriches Bay beyond the backyard. The kitchen, behind a living room/dining room combination, has recently been updated with stainless steel appliances. New windows and plumbing were installed, there’s central air conditioning, and the front yard is lined with rocks for ample parking. The home is listed with Jackie Nedvin of Carol Michaels Realty.